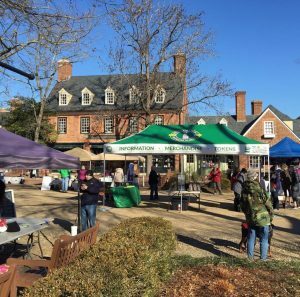 Situated in Colonial Williamsburg, Virginia, the Williamsburg Farmers Market has been flourishing on the local food frontier for 15 years. Williamsburg Farmers Market is a veteran market resource and working example demonstrating how growth can be achieved by meeting challenges, collecting statistics, seeking advice, and fostering collaboration. Counting down to their 500th market this December, something new for the market books was Pop Club. Introduced in April, it was well received- a total of 226 children participants, some of which experienced the decidedly favorite squash cars activity. Market accomplishments and milestones include the 10th anniversary Fresh Film Festival, the addition of SNAP/EBT as a legacy project, and the hosting the Virginia Farmers Market Association Conference this November. The Williamsburg Farmers Market finds itself in the mix of community while increasing local food support thanks to contributors dedicated to sustaining, fostering, and operating the beloved farmers market. Learn more about the Williamsburg Farmers Market below and get a visual taste of the market while they take over our Instagram! Tracy Herner: The Williamsburg Farmers Market is a 501c6 that began in 2002. The market employs 3 people, and has an average of 40 vendors weekly. The market is a Virginia producer-only market with a preference for those in the Eastern part of the state. The market is like a family, with lots of personality and stories, even romance! We do have guidelines as to who can and can’t sell at the market, and vendors pay a percentage of their weekly sales instead of a flat stall fee. Williamsburg Farmers Market is an outdoor market that operates in Merchants Square rain or shine every Saturday from March through November (42 weeks). Merchants Square is at the end of historic Duke of Gloucester Street, part of Colonial Williamsburg. Duke of Gloucester Street is 1 mile long and 99 feet wide. With live music and chefs demonstrations, the Williamsburg Farmers Market is a fun place to visit, shop, and meet up with neighbors! FMC: You have 40 vendors at your market, what is the breakdown of the vendors? TH: It’s amazing to think that at our first market in 2002 we only had 16 vendors. Before our market launched, we called in the experts at American Farmland Trust, and they were willing to share some key tips which we still use today! One of those tips was the recipe to a successful market, which includes the blend of vendors. 63% of our vendors are growers/farmers, 32% sell prepared food (not intended for immediate consumption), and 5% fall into the “other” category (which includes knife sharpening and soaps.) This isn’t an exact math, and many of our vendors fall into multiple categories, but we use it as a guideline. We use other methods to determine our blend also, like watching to see how quickly certain items sell out, visiting food and beverage shows to see what’s trending in the world of food, and talking to our local chefs to see what they have on their wish list. As important as it was to our success to have had good mentorship, market staff now provides that assistance to other markets! Whether it be sharing information on marketing, accepting SNAP, fundraising or vendor recruiting, we are happy to share what we’ve learned! FMC: What are some staples of your market and are there any new programs or events? TH: The market board of directors and staffs spends countless hours planning for success each season. Musicians and chefs are recruited months in advance. The market began accepting SNAP in 2013 and is pleased to offer a 1:1 match up to $30 weekly. This year launched our Power of Produce Club in conjunction with WJCC Student Health Initiative Program. This year we began doing monthly festivals. Our first festival was for Easter. FMC: Can you describe some of your market festivals? TH: Having events is a balancing act. The market is an event, so we have to be careful to not make an event bigger than the market. Easter was a huge success, with hidden eggs at vendor’s stands and a visit from the Easter bunny. We also have a strawberry festival, where people came dressed like strawberries, and many vendors made products featuring the strawberry. Our next big thing will be Halloween. A local farmer donates pumpkins for children to decorate and we will have a fall themed scavenger hunt, and more. Christmas is huge in Williamsburg, and our last 2 markets of the year will be amazing! TH: The Williamsburg Farmers Market has a relatively small advertising budget. We do most of our advertising online for free. We place our weekly markets in every event calendar for our region and some statewide. We do radio interviews, use Facebook, Twitter, and Instagram. We send out a weekly newsletter, and have a newly revamped website. We work with community partners to make it easy for them to help spread the word about our farmers market. For new markets, I would recommend starting with free event calendars. TH: There are many things the cause the Williamsburg Farmers Market to be special. For one, from the very beginning, we had the support of the City of Williamsburg, Colonial Williamsburg, Merchants Square, the College of William and Mary and the Land Conservancy. These are all critical players in our community who decided to work together towards a common goal of getting local food back in our wonderful community. We have extremely loyal vendors who took a chance on our market before farmers markets were trendy, and have stayed with us all these years. Our location makes it so we are a gathering point for our community, and also an event that represents our community to students, visitors and tourists. In 2013 we began working with FMC to really identify our impact on our community. We are hoping in this final year of the Farmers Market Metrics grant that we learn to share what makes us special in a meaningful way. Our vendors are amazing! One of our farmers works with SHIP to supply the local schools with produce. 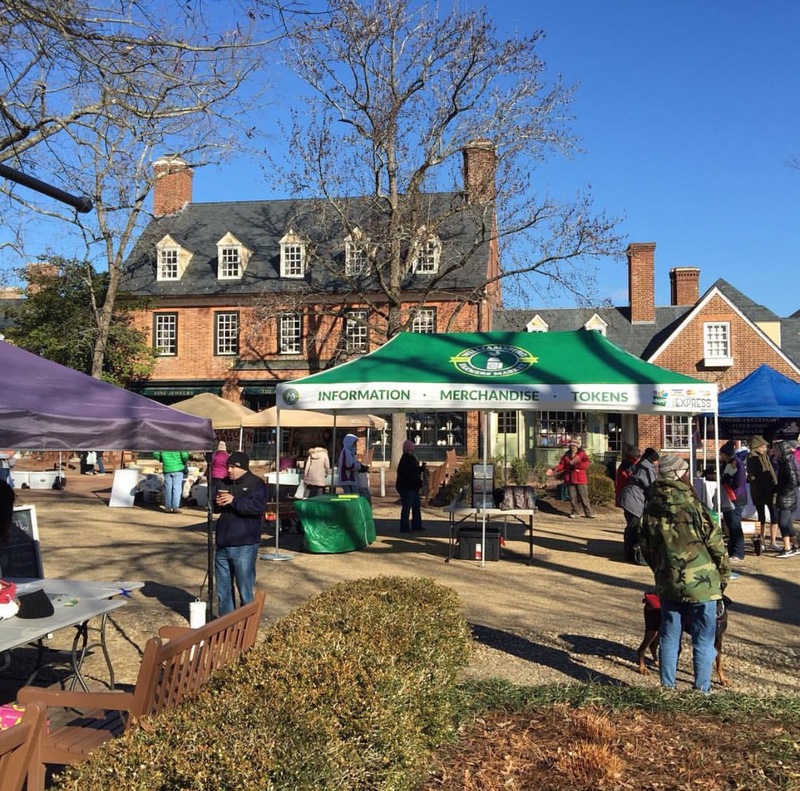 They also work with the College of William and Mary and their Office of Sustainability to have students work on the farm and supply produce to their dining halls. One vendor who attends many markets is always willing to help struggling markets by giving key perspective. Another vendor received a significant specialty crop grant. It is a true pleasure to work with such amazing people. FMC: What are some of the challenges your market has faced? TH: I think the biggest challenge our market has faced was creating a central currency. We really wanted to be able to accept SNAP, but it was a difficult process, dealing with a fiscal agent, spreading the word to the community, and creating processes. Our market is getting ready to celebrate its 500th market, and next year will be celebrating the 15th anniversary. FMC: How did you guys overcome the initial challenges while incorporating SNAP/EBT and how do you continue to meet associated challenges? TH: Creating a currency is hard, especially if you aren’t your own fiscal agent! It’s easy to get overwhelmed by the unknowns of something new, but after committing to creating a market currency, we spent time working on an action plan to work all of the potential problems. Our market currency has changed the dynamic of our market! We interact more with market customers because they are coming to us to get tokens. We interact more with our vendors, because of the tokens. We interact more with our community, because of the tokens. There are still challenges, and there most likely always will be, related to tokens and SNAP at markets. Our plans for the future are to grow our Nutrition Incentive Network in VA, and to continue to push for program expansion for WIC and SFMNP in VA. We’ve shown that a central currency works, but those programs still require the farmer to sign up, which limits the purchase power of those incentives.